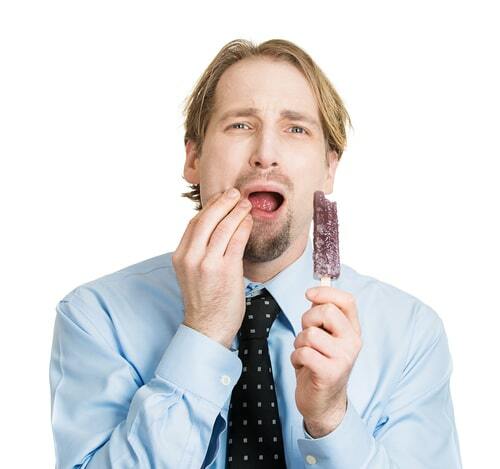 Sensitive teeth can range from being an annoying affliction that prevents you from eating certain hot & cold foods, right through to being a symptom of underlying dental problems that may require urgent treatment. If you suffer from sensitive teeth, then you should make an appointment with dHealth Dentistry today. To begin, the cause of the sensitivity must be identified in order to determine the appropriate remedy. Some people suffer from sensitive teeth for no reason at all; if this is the case, then we can recommend toothpaste that will numb the sensitivity and provide you with some pain relief. For example, in the case of exposed dentine, de-sensitising toothpaste can also be of assistance. Exposure of the dentine can be caused by: gum recession (when the gum pulls or shrinks away from the tooth exposing the root of the tooth), acidic diet, reflux or bulimia causing enamel erosion, brushing too hard or with an overly abrasive toothpaste, as well as periodontal disease. Dentine is made up of microscopic dentinal tubules that direct channels to the nerve of the tooth. Cold drinks or ice cream can cause the fluid in these dentinal tubules to move rapidly, stimulating the nerve and triggering pain. Desensitising toothpastes assist in blocking pain signals from the nerve or by creating a barrier over the tubules. If decay or cracks in the teeth are found these will be treated through filling or bonded ceramic restoration. Why treat Your Sensitive Teeth? Sensitive teeth can prevent you from eating the foods you love, having sensitive teeth may prevent you from enjoying that invigorating cup of coffee in the morning (heat) or joining your friends for a treat of ice cream on a hot day (cold). Sensitive teeth could be caused by more sinister underlying dental conditions that need to be treated before they become serious. If decay is causing the sensitivity you will need to have this treated or a root canal treatment or even tooth extraction may be necessary. The sensitivity may also be a result of incorrect brushing methods. If you brush your teeth to hard you can break away the enamel and even cause your gums to recede, both of which can pose serious dental health problems. By visiting dhealth Dentistry we can treat the sensitivity and instruct you on how to brush your teeth properly. Sensitive teeth may also be a result of nocturnal bruxism, this needs to be treated with a splint (mouthguard) in order to prevent serious problems from occurring further down the track. dhealth Dentistry has one mission: to offer an improved smile with exceptional care to everyone who wants one. At dhealth Dentistry we not only provide exceptional care, but we do so in a manner that suits your preferences and even your budget. We are based in Camberwell, Melbourne close to suburbs including Hawthorn, Kew, Burwood, Ashwood, Ashburton, Balwyn, Surrey Hills and Glen-Iris. Your smile is our reward. Click here to book a dental appointment online.